Pro winner Brandon McMillan holds up his two biggest bass from day four on Lake Okeechobee, part of his FLW Tour record setting 20 bass weighing 106-10. CLEWISTON, Fla. (Feb. 6, 2011) – Walmart FLW Tour pro Brandon McMillan of Belle Glade, Fla., caught a five-bass limit weighing 25 pounds, 7 ounces Sunday to win $125,000 at the Walmart FLW Tour presented by Evinrude on Lake Okeechobee with a four-day catch of 20 bass weighing 106-10. McMillan’s total weight set a new FLW Tour record for heaviest total tournament weight caught. Coming from behind, the catch gave McMillan the win by a solid 4 pound, 8 ounce margin over EverStart pro Randall Tharp of Gardendale, Ala., who caught a total of 20 bass weighing 102-2, earning $35,000. “This is like a dream come true. I’ve watched my dad (Jimmy McMillan) win for so many years, it feels good to do it myself,” said McMillan, who was fishing in his first ever FLW Tour tournament. “Randall (Tharp) and I were sharing the same water all week. He has always been one of my heroes and to win with him in second place is pretty special. “I was a little nervous the first two days after seeing the weights come in knowing that most of it was caught sight fishing,” McMillan went on to say. “However, I stuck with flipping the mats on the north shore and that’s what made the difference. I didn’t catch a lot of fish today, but I landed the ones that mattered. Conditions changed on the lake today, the wind picked up and early morning fog covered the lake taking sight fishing out of the game. Unlike most of this week’s anglers, McMillan did not do any sight fishing, he went flipping. McMillan believes that it was his flipping that won the tournament for him. McMillan opened the tournament in sixth-place Thursday with five bass weighing 27 pounds that he caught flipping 1 ½-ounce tungsten weights on a Gambler KO Flipping Hook while fishing the north shore. On Friday he added another five bass weighing 28-14 using Gambler BB Crickets and Bruiser Intruders to jump to third place. 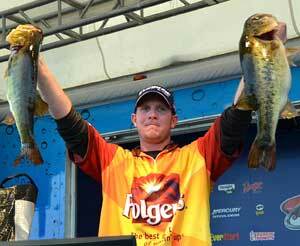 He then caught five bass weighing 25-5 on Saturday to make the crucial top-10 cut in fourth place. On Sunday he sealed his victory by continuing to flip the grass mats on the north shore with his Gambler BB Crickets and Bruiser Intruders, both in black & blue. The previous record for heaviest total tournament weight caught was set in 2010 by Brent Long of Cornelius, N.C., when he caught 95 pounds, 7 ounces, on Lake Guntersville. The top four anglers in the Lake Okeechobee tournament, Randall Tharp, Chad Prough and Terry Scroggins, all shattered that record as well. Overall there were 45 bass weighing 153 pounds, 2 ounces caught by 10 pros Sunday. The catch included nine five-bass limits. Aymon Wilcox of Lauderdale Lakes, Fla., won the Co-angler Division and $20,000 Saturday with a three-day total of 15 bass weighing 55 pounds, 14 ounces followed by George Kapiton of Inverness, Fla., in second place with 15 bass weighing 53-10 worth $7,625. In FLW Tour Open tournaments, pros and co-anglers are competing for valuable points that could help them qualify for the 2012 Forrest Wood Cup, the world championship of bass fishing. The top five pro and co-anglers in the points standings from the four Walmart FLW Tour Open tournaments will qualify. The recent Lake Okeechobee Tour stop presented by Evinrude was hosted by Roland & Mary Ann Martin’s Marina & Resort, and was the first of 10 Walmart FLW Tour tournaments that will be held in 2011. The Walmart FLW Tour presented by Straight Talk is the next tournament and will be held March 3-6 on Beaver Lake in Rogers, Ark. The event will be hosted by the Rogers Convention & Visitors Bureau and boats will launch from Prairie Creek Park in Rogers, Ark. For a complete schedule, visit FLWOutdoors.com. Coverage of the Lake Okeechobee tournament will be broadcast in high-definition (HD) on VERSUS. “FLW Outdoors,” will air March 20 from 1 to 2 p.m. ET. “FLW Outdoors,” hosted by Jason Harper is broadcast to approximately 500 million households worldwide.